Bob K. of the Ramen Tokyo blog came to try our tsukemen. He was eager to try our gyokai tonkotsu-based broth, which he says is the first time he's had it in the United States (outside of Japan). 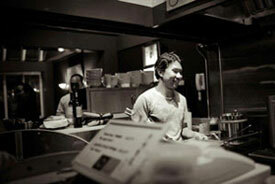 Check out his ramen blog to read more. Chef Leo featured in Urban Kabari's Video! While the noodle press is rolling, Urban Kabari sat down with Chef Leo to talk about Kirimachi Ramen, and captured a behind-the-scenes look at how shoyu ramen is prepared in-house. Watch the video below or on Facebook. Support Kirimachi Ramen by giving this video a "thumbs up" on Facebook and on the YouTube video. "The broth is incredible and very flavorful. It was like taking really good ramen broth and reducing it down to rich and fatty perfection. The noodles were also cooked perfectly, thick and nice consistency with a great chew. The soft boiled eggs were runny and yolky (I had an extra order). The four pork slices were tender and tasty. I loved the mushrooms and bamboo shoots. The different components added extra excitement to the ramen bowl, but the noodles and broth were the true stars and I'd be happy eating those two things alone at Kirimachi. The tsukemen gets two thumbs up from me. I would highly recommend it." You can read the rest of her review on her delightful blog covering San Franciso Bay Area's culinary scene (and beyond), bites&bourbon. "With the temperature approaching the 90s on Tuesday, I figured it was an opportune time to try out the cold noodles my local ramen-ya, Kirimachi Ramen, was featuring. It turned out that they had not one, but two cold noodle offerings, Hiyashi Chuka ("cold Chinese [noodles]") and Tsukemen (dry noodles with a dipping sauce). Since the tsukemen isn't really eaten cold (because the noodles are dipped in a hot broth) I decided to go with the Hiyashi Chuka and try the Tsukemen the following day when odds were that it wouldn't be quite so hot. Hiyashi Chuka consists of a selection of chilled strips of seasonal vegetable and animal material arranged on a bed of ramen noodles that have been bathed in a sweet-sour tare. It is served with a dab of very spicy mustard which can be stirred in to add a little heat if you desire (and I did). In essence, it is a cold noodle salad, and as such is very satisfying on a very hot day. The temperature in San Francisco hit 94� that day, hottest of the year, and the cool medley of textures and flavors was indeed extremely refreshing. The Tsukemen, which I returned to try a day later, on the other hand, was visually as plain as the Hiyashi Chuka was colorful. A shallow plate of dry (i.e. drained) noodles comes topped with bamboo and green onion, accompanied by a bowl of broth to dip the plain noodles in. The artistry is reserved for the complex broth, which at Kirimachi is pork-based. The naked noodles also give one the opportunity to taste the alkaline noodles for what they are, before dipping them into the broth provided. To a Tsukemen novice like me, the dish is considerably less appealing than the Hiyashi Chuka ramen at Kirimachi. However, Tsukemen is reportedly the hottest noodle fad in Japan. Leo and Febry, proprietors of Kirimachi Ramen, will be traveling to Tokyo after the conclusion of the Off the Grid: Fort Mason Center season, and one of their priorities will be to investigate the state of the art in Tsukemen crafting. I'm looking forward to their help in developing my palate after they return." 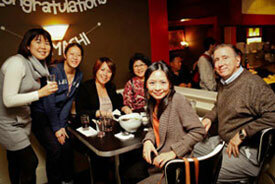 "I hit Kirimachi, a ramen place in the North Beach area of San Francisco for lunch last week. In short, it was crazy delicious. I had the tonkotsu ramen, the pork broth for which takes at least 12 hours to make. It's a lighter, less greasy style of broth than many people might be used to, but I really liked it. My bowl of tangled noodles and broth also had a pile (pile!) of slow-cooked pulled fatty pork on it - eons better than the usual slice of barbequed or roasted pork. It's sheer deliciousness isn't why I'm writing, though. 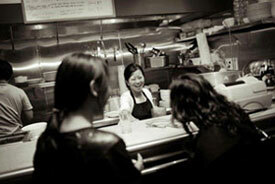 Kirimachi uses high quality meats, including Marin Sun Farms chicken. For plenty of people who only eat organic or local or are otherwise heavily invested in the sustainability of their food, it's nice to be able to follow those principles no matter what style of food they're enjoying." 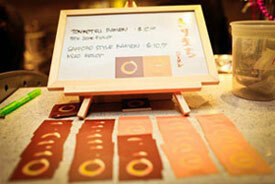 "Most local ramen fans now understand that there are many different styles and versions of ramen. Kirimachi's Tonkotsu broth is not as heavy or oily as the traditional versions from other ramen shops, because this is a homestyle broth. The type a Japanese housewife would make. Ramen purists might think it's too light, while people who dislike heavy and oily broths would be pleased." "If it's ramen you're after, come to Kirimachi for the best broth in the city." Thank you, Noodle Guy, for taking the time to check us out! "I ordered the Tonkotsu ramen cause it was what they were known for. At first glance, it looked good but the bowl was a little small. We were all so hungry waiting; we all just dove right in to our ramen without saying a word to each other. To my surprise, the ramen was delicious!" "Although Katana-Ya's location is subtle, Kirimachi Ramen can be even easier to miss, located on the fringe of North Beach, inside a hole-in-the-wall storefront that opens up to a quaint little dining area. Typically, many ramen houses will offer either pork belly or slices of pork tenderloin as add-ons, but Kirimachi remains unique for its shredded pork. Kirimachi is cash only." In this blog post, we were pit amongst some local favorites and came out as #3 in Accidental Wino's list of "6 Bay Area Lunchtime Options." We're featured in episode 5 of Food 'n Beverage SF! Starting at the 4:40 minute mark, Mike (right) and PK (left) share their Kirimachi lunch experience--the good, the bad--all the way to the end of the video (28:41 minutes worth). PK who had the Shoyu Ramen gave us a score of 3.5 - 3.6 out of 5 based on his experience at many different Bay Area ramen shops. And Mike, who has never eaten ramen at a ramen shop until now, tried the Sapporo-style Ramen and gave us a solid 3.0. They admit being hard graders, but despite the score, they said that they enjoyed the food and experience, would return, and would definitely reccomend Kirimachi Ramen to others. Watch their video (link below) and be sure to listen to their candid opinions that include getting past the "cheap ramen" mentality and figuring out how the restaurant's modern deco fit into the ramen shop theme. Thank you Mike and PK for trying our ramen! Salud! "The broth was nice and creamy, and more importantly, not too salty unlike some places' that I've tried." Jonas enjoyed one of our most popular ramen - Tonkotsu Ramen, especially the shredded pork and soft-boiled egg that comes with it. Be sure to check out the pictures he took, especially of Leo in his domain and our choice of spices. 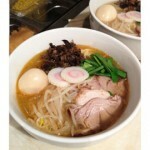 [Note] Though Jonas wrote Tonkatsu Ramen in the image description, he meant Tonkotsu Ramen. "Kopi luwak coffee runs $20 to $40 a cup and is difficult to find, even in bean-obsessed San Francisco. I scoured the city until I found Kirimachi, a pop-up ramen restaurant in North Beach, seemingly the only place in San Francisco serving kopi luwak. The most expensive coffee in the world comes to your table in a single-serving envelope, very finely ground, and a card verifying its authenticity, all tucked in a gauzy drawstring bag." Kopi Luwak is available at our Broadway location for those who would like to try some, especially on a cold day or when you just need a unique pick-me-up. Just be aware that there may be times when we don't have it. But until that time arrives, we'll be glad to make this for you. We're @ Off the Grid Fridays! Off the Grid returns to Fort Mason. This time, we'll be there too, as one of the six new vendors. We'll be ready whenever the wind picks up, so look for our sturdy orange tent and have some hot ramen. We're a "You Gotta Eat This!" Marcia (aka Tablehopper) mentioned us in her weekly Tuesday segment of "You Gotta Eat This!" on KGO Radio. Look for her February 7, 2012 taping. "This two-month-old North Beach pop-up is already being compared to Saiwaii, although the general consensus is that the broth here is a bit on the lighter side. Owner Leonardi Gondoputro offers tonkotsu, chicken miso and plain miso broths with custom-made noodles and quality meats from Marin Sun Farms." "I'm happy to say that Kirimachi's tonkotsu broth, like their miso broth, leans toward deftness and subtlety, demonstrating that a tonkotsu broth needn't be as muddy and yellowish as a river in Shaanxi (are you listening, Ajisen?)." Gary continues his year (of the ramen) with our Tonkotsu Ramen this time. He learned something very important about this ramen bowl -- stir the soup before every sip. Though we don't blame him for getting distracted by Leo's artful topping arrangement. "Last week, my heat-seeking tactics included a bowl of [Sapporo-style miso] ramen at Kirimachi (pictured), jook in Chinatown, and some chicken noodle soup I made at home. After watching an episode of Easy Chinese on the Cooking Channel, this recipe for Savory Sour Chicken Noodle Soup is gonna be what's cooking next over here at Hopper HQ." Glad that our soup is an inspiration to Marcia and for her recipe. So, what is the secret to our flavorful soup? The fresh ingredients, of course! Especially our Marin Sun Farm chickens which add a lot of flavor and sweetness to our soup base. Given this big clue, you'll have to come try the soup to verify this secret personally. We've been spotted and highlighted by editor Devina Baum in AFAR, a collaborative travel guide. "This past week, my dining recon for these two guidebooks brought me to the incomparable Benu (foie gras xiao long bao, I can now die peacefully and go to heaven), and Sons & Daughters (perfect for date number two or three), in addition to warming up over a bowl of ramen at Kirimachi, popping up in North Beach." Marcia graced us with her presence during this rainy season while working on her books. We wish her the best of luck as she ventures down the path of authorship. "The noodles themselves were cooked perfectly, al dente without being overly chewy. The soft-boiled egg was also cooked just right, with firmly set white and a nicely runny yolk. Overall, it was definitely one of the best bowls of ramen I have experienced, and I'll certainly be returning." And oh, yes, John Lennon's "Power to the People" was playing as I ate my ramen. Right on, Leo!" It sounds like Gary Soup started his year (of the ramen) well with a great bowl of our Sapporo-style Miso Ramen. "Yup, it's another year of ramen, ramen, ramen. A new pop-up ramen shop opened in the Usual Suspects Cafe on Broadway called Kirimachi (450 Broadway Street), which means "fog city." Chef Leonardi Gondoputro has worked in Japanese restaurants for the past four years (including Sanraku, but they don't serve ramen there). Turns out it's one of his obsessions – he likes ramen so much he wanted to make his own. He is serving two kinds: tonkotsu and chicken miso, using proteins from Marin Sun Farms, and the noodles are custom made. A bowl is $10, tax included. Hours are Monday–Friday 10:30 a.m.–2 p.m. and 5:30 p.m.–9 p.m. (He is sharing the space with another vendor, so he isn't in the location full-time.)" If there was such a year, we're definitely a good representative of the year of the ramen, hopefully Marcia and Northside San Francisco readers think so too. "What's the word on Kirimachi Ramen on Broadway?" Based on the replies to jman1's post, we're doing something right. We're still new but we hope to continue making great ramen for everyone. "North Beach: What the world needs now, is ramen. And a lot more of it. Kirimachi is the latest contender, and we learned the details from Miss Tablehopper. [EaterWire]"
If ramen could help bring peace to the world, then the world definitely needs more ramen, now. We can't promise world peace, but we think our noodles could help bring a little bit of peace by quieting one stomach at a time. 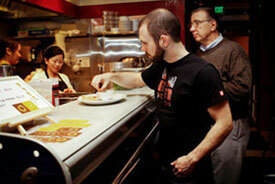 We're on SF Eater's Noodle Wire! "Tonkotsu != [sic] tonkatsu, for what it's worth." "The ramen is simple and good." "The newest ramen contender in town is Kirimachi, open as of this week in the pop-up venue Easy Creole's owner just started in North Beach. Owner Leonardi Gondoputro, a.k.a. "Leo Go," is a former Sanraku FOH man turned ramen obsessive, now cooking up $10 tonkotsu and chicken miso bowls for weekday lunch and dinner. Tablehopper has a few more details. Do share early reports in the comments. 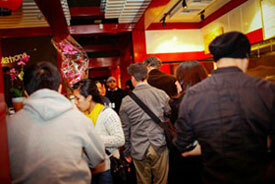 [EaterWire, Tablehopper]"
Tablehopper was kind enough to stop by at our soft opening and try out our specialty -- ramen. It was a great turnout with lots of happy faces and ramen going around! 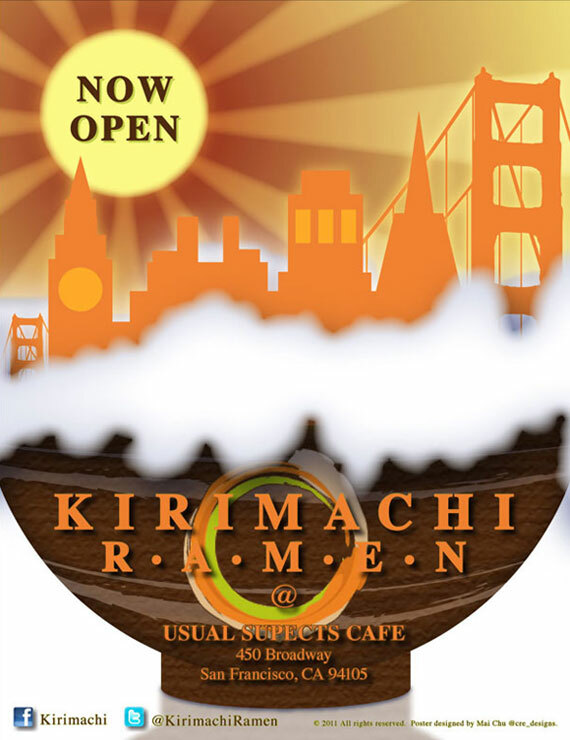 Tonight's the soft opening of Kirimachi Ramen at Usual Suspects Cafe, 450 Broadway (between Montgomery and Kearny Streets) in San Francisco's North Beach neighborhood. [Note] Poster was designed by Mai Chu.